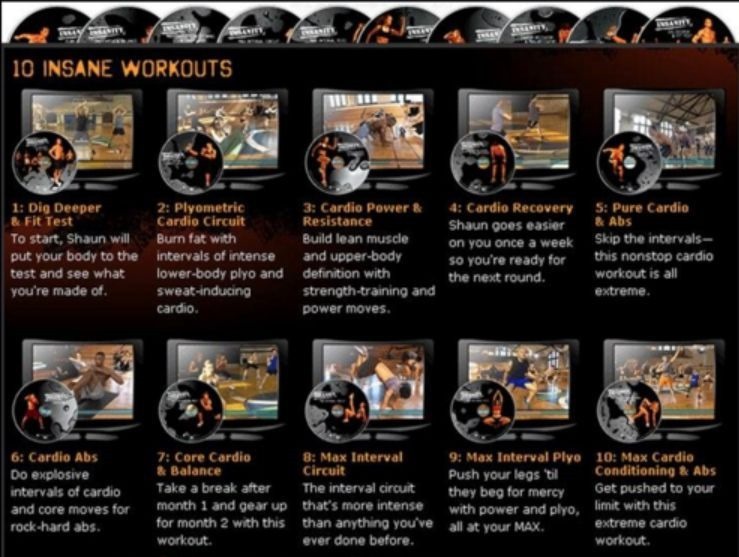 This is the first in a series of reviews of some of the top home workout DVD series, starting with Insanity. I’m the sort of person who has “projects”. It’s a case of this or simply risking madness with the ever present feeling that at any one time I am not “accomplishing” something creative. For example, for the year 2009 through 2014 I was writing the epic 300,000-word tale of Cesca and my year away travelling around the world. Having completed this I set myself a new task – a project to refilm a classic martial arts instruction video from the 70’s. That requires I get in shape! I first came across the work of Beach Body and its most famous son, Shaun T, when stuck in the Pittsburgh one night and unable to sleep. I never sleep well in hotels. I put it down to the air-conditioning, but it is just as likely to be the jet lag or isolated feel hotels engender. Pittsburgh feels naturally isolating as you cannot actually walk anywhere; there isn’t much in the way of pavement, and coming from a city of 12 million to one of 500 thousand it feels sparsely populated most of the time. On this particular night, I woke about 2 am having drifted off to sleep with the TV on. What greeted me was an infomercial and, for once, I was simply too drowsy to turn it off. Instead, I listened all the way through. Beachbody promises a lot in its infomercials. They are slickly produced and full of pump and verve. They seem to say that a better, no a great body, is just 60 days away and 3 small payments. Payment practically that will pay for themselves in results. Normally I would rather watch paint dry than watch this. They use every technique in the marketing stable. They play on your insecurities, they display people who have made enormous changes seemingly with ease, look at those smiling faces, in only a short period and with a small effort. They promise bonus DVD’s, special extras, even prizes for success. They invent a cult of the celebrity trainer and the social networking. They even break the fourth wall sometimes and have the video editor actually speaking to the audience. It’s a hard sell that turns the British off. Fixed smiles suggest a vapid fantasy. A few weeks later, it was Christmas and I was unhappy with my excess. I love Christmas and it’s my main holiday season of the year. So, I usually overindulged like most people. It’s an easy position to get in. I just don’t have the time to visit a gym every day. I used to lift weights a lot, indeed still do in some forms, but I know that bodyweight is all the weight one needs to workout. Getting to a gym, getting changed, pumping the machines and free weights, getting showered, dressed and then travelling home was going to take a large toll on my free time. Free time I wanted to share with my family. I suddenly realised that if I worked out at home, I would be showered and changed, ready to be with my children, ready to be with my wife, in minutes. No drive or large cost. Easy. If I wanted to change things permanently, I needed a solution that – in some respects – involved my family and friends. A gym is a very private and, to me, somewhat narcissistic activity. Lonely. Working out at home could be something that we did together as a family. It would cheaper and easier to control my recovery routine at home. So, I cracked and got the Insanity program. Now, one year later I am ready to take stock of that journey. I will start by reviewing the programs I have completed. Insanity is the granddaddy of home workout programs. You probably know someone who has tried it and some of the stories regarding the sessions. Filmed over 5 years ago, it revolutionised the market in terms of what you could push people to do at home. 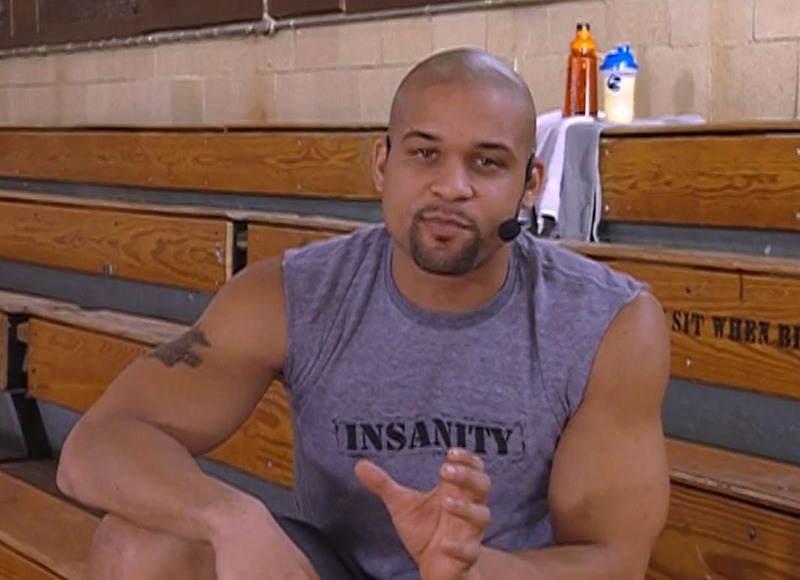 Fronted and purported invented by Shaun T, Insanity is a set of circuit classes between 30 minutes and an hour-long. All you need is your body and your will power. Filmed in a large hall it enhances the class feel by the instructor standing at the front of 10 people all doing the workout together. The camera is constantly moving between Shaun and the others working out as he pumps out a high tempo of motivation and technical advice. Near the front, he always has two particularly attractive female volunteers whom he uses to demonstrate how someone might keep up with the program. These two are professionals and able to keep with him like machines. The rest are more usual people, a mix of fitness instructors, climbers and ex-army types who have helped in the beta program as the classes were developed. These people struggle similarly to you will be working out at home and Shaun’s motivation is all that keeps them going at times. Each class starts with a warm-up, set to raise your heart rate. This is followed by a stretching session with Yoga poses before moving onto the full work out. On the screen a timer bar counts down the time remaining on the current movement and is to the second accurate. You follow the moves and switch when ordered. So far this doesn’t sound too hard, but there is a vital element to all the insanity DVDs and it is Intensity. 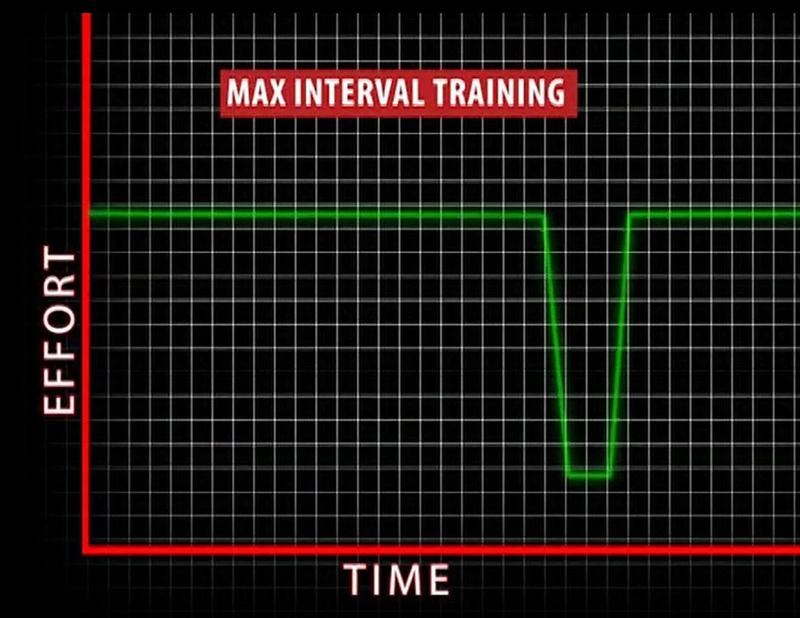 High-Intensity programs work by forcing the body to its peak over short periods and then bringing the heart rate back down through a soft activity or short break. Insanity is set up and cleverly designed to be on the pure cusp of exhausting without overtaxing one particular muscle group before moving on to the next. For example, Shaun may have you do running on the spot and hurdles and then have you drop into burpees for 45 seconds before switching to the plank and mountain climbers, raising the knees up to the chest. There is a lot of jumping style moves and using parts of the body like a spring. Such as taking a wide stance, sending out 6 punches and then jumping up, spinning around to face the other direction and performing another 6. This pace is tough, very tough in the beginning. However, Shaun is actually an excellent motivator and it is not hard to work through your sweating and swearing to get from one end to the other. One of the cleverest motivators is seeing that the others in the class are just as busted as you are. Some really struggle, even the “ringers” at the front. Even in one case Shaun himself who calls a stop to a repeated activity early. Everyone moans and works together and this aspect is a great part of the success. I found that the amount of floor spaced required for these activities is enough to lay down and lay down you will as you are broken by the harder moves. Another motivator worth mentioning is the excellent music. The track is not one constant theme or playlist, rather it is tied to the context of what you are doing. So, for example, if you are working the last parts of a section, and probably tired, the music will dramatically drop into a theme that suggests “you can do it!” to give you that aural push to complete. This effect cannot be understated as an emotional lever, especially since you are more likely to be affected by it at times of exhaustion. Indeed Beachbody always has excellent music. The classes are all slightly different and ordered in such a way to concentrate on different aspects of fitness. Following a cardio workout will be a more strength based one and over the weeks each slot neatly into a day’s activity. Then there is a break between month one and two where you repeat a more relaxed DVD that contains stretching and not so much high heart rate work. Month two is significantly harder with less break between activities and many more activities back to back. What I quickly found was that some of the activities were easy for me, some were hard and it will be different ones for me than for you. By month two the other classmates start to pull ahead. Some can put in a truly Herculean effort that I couldn’t match at all. Shaun is pushing harder as well; in one class he beats the drink out of the hands of an exhausted class member and drags him back onto the mat. It is done in good humour, but it demonstrates the commitment required even by those being paid to be there. 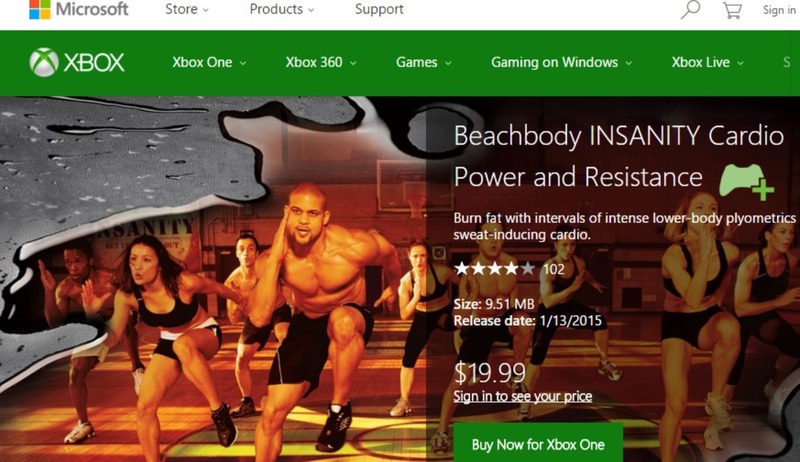 If you have the modern wonder that is an Xbox One from Microsoft, you can take on the Insanity program with that too. The Xbone is (usually) sold with a Kinect device, which is an infrared camera that you mount on your TV and that watches you as you work out in Xbox Fitness. The benefit of the Xbox version is that it checks you are doing the move correctly and turns the whole thing into a game, with multiplier bonus scoring for doing move after move perfectly. Afterwards, it breaks down how you did against other people of your demographic. I found its motivating aspect to be excellent, but it struggled to record certain moves I was doing in the space I had to do them. Even in my new front room, which is twice the size, it was unable to get me entirely in camera. If you have a shortage of floor space my advice is to stick with the DVD versions. In the end, I completed Insanity two times before moving on. By this time my wife had expressed an interest in joining in, but that Insanity would be far too difficult for the beginner. I had to agree with her assessment. Insanity is excellent but tough as nails. It asks a lot of you and your body and one has to take care of recovery as I will outline later, or risk injury quickly, which will destroy your motivation. I found that I was never bored doing the program and would look forwards to getting it done every night. Of course, a nightly activity is a big ask, not only for me but also for my family who have to support me working in the front room. I found that if I needed to skip a day or reorder things, that this was the best method of fitting in Insanity to my life. However, make no mistake; doing Insanity half-heartedly is also asking for injury. All in all, I would rate Insanity to be a rite of passage everyone should do. It is the “original” and a very well designed product. Shaun is an excellent instructor and great care has been taken with how the program is structured. I would rate it difficulty as High and its benefits as High. It is unforgiving and that shows its age against the newer entries coming up. On average I burned 500 calories and up to 800. The results? I lost over 12Kg doing Insanity. That’s 2 stone! The original is still now on my weekly DVD rotation and I never get tired of seeing Shaun and his crew for a busting workout! Next up in this series will be T25 and Cesca joins me for this one!